Instagram is a visual-centric social platform with more than one billion users. Users can post photos, videos, and share information via Instagram Stories. 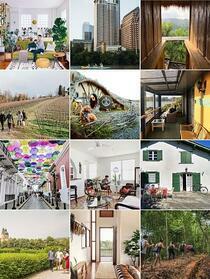 People enjoy sharing everything from travels and food to daily activities and outfits. On the business side, Instagram is a platform to share products and services, provide tips for your industry, and highlight your company’s personality. With over 25 million business profiles on Instagram, your company should definitely add this platform into your social media marketing strategy. If your business is already active on Instagram, you’re one step ahead of the game. You might find, however, that you may be forgoing a few key steps in an effective Instagram marketing strategy. If you’re totally new to the Instagram game, you came to the right place. We’ll dive into Instagram marketing for businesses: Everything you need to know about strategizing, creating content, engaging with your audience, and tracking your analytics. Every strong marketing strategy begins with exactly that: a strategy. What has your business done to market itself on social already? Are you active on the big social networks (Instagram being one of them)? If you are, take a step back and analyze your past efforts: were there any impediments that held you back from selling more products or services? What parts of your previous marketing plan crushed it, and what parts didn’t perform so well? Being able to learn from these takeaways will help guide you in the right direction while building out a new strategy. Once you’ve established this, you’ll next have to define your marketing efforts. So, what are you as a business trying to accomplish by actively posting and engaging on Instagram? What are you trying to build on to build a stronger brand identity on social media? Specifically defining the goals for your marketing strategy keeps you on target and gives you specific points to track and measure its progress. Ex. A company that does a great job of showcasing its products may lack in sharing more about their company culture. They can create a target-specific objective to increase the amount of posts they dedicate toward highlighting its employees, life at work, and company culture. The biggest thing to remember when determining which marketing objective you want to focus on is: be specific. You want to highlight company culture? Your marketing objective could sound something like this: Highlight company culture by dedicating three posts per week to show off our office, work life, and employees. Looking to increase your follower count? Your marketing objective might be: Increase follower count by 30% by following new users that could be interested in our product/services and posting more graphic heavy content on our feed. By getting down to the nitty gritty with your objectives, you can easily monitor if your strategy is working toward accomplishing them. Your objectives don't have to be concrete; over time, you can tweak your key objectives and your overall strategy to best suit the results you've seen and maybe even add new objectives you want to tackle. Everything you publish on Instagram, and social media as a whole, should be tailored toward your target audience – the people that relate to, connect with, or buy from your brand the most. The majority of Instagram users are age 18 to 34 – ages 18-24 making up 31% of all IG users and age 25-34 making up 30% of all users. Luckily, this age demographic is great for businesses who are looking to target that younger audience. But this doesn’t mean your business should shy away from Instagram if your audience is slightly older than the average user. There are still opportunities to engage with Instagrammers, build more interest around your brand, and promote your business in fresh, creative ways. Over 200 million Instagram users visit at least one business profile a day. 80% of Instagrammers follow at least one business. If your company is new to Instagram, you'll have to use insights from other social platforms to learn who your user persona is. A user persona is the same as a buyer persona: a semi-fictional representation of your ideal customer. In the social media sense, it can be a representation of your ideal follower. Do your research. Find out your ideal customer's age, location, stage of life or anything that can help you establish the content you should share via Instagram. If you've been on Instagram for a while and are looking to better target your content to attract more followers who are similar to your current followers, take a look at your Instagram Insights. You might notice when taking a look at your Audience Insights that the current audience you have isn’t quite the one you were looking for. Though you try to target toward the 18-24 crowd, you may come to realize your largest audience is 35-44. Use what insights you do have to guide your strategy. If you want to reach a younger crowd, how can you switch up what you are doing on Instagram to help do that? Let your insights be a starting point; keep an eye on them as you begin to switch up your strategy, post newer, engaging content and experiment with your feed. You’ll either see a difference, or learn that what you’re doing might not still be good enough to attract the best people for your brand. Don’t let it discourage you. It’s all a learning process. But with a few tips and tricks about creating content and engaging with your audience, you’ll be on the right path to Instagram marketing success. Your Instagram marketing strategy revolves heavily around content creation. Without it, how can you share valuable information about your business? What is the point of having all those followers? Instagram is an awesome visual platform for publishing content about your brand, products and company culture. In the past few years, Instagram has skyrocketed their content tools, directly competing with Snapchat and YouTube. We will break up the content into four categories, then dive further into each. Instagram feeds are the OG content type on Instagram. An Instagram feed is basically a collection of all photos and videos that people you follow post. You can either scroll through your feed to see all your followers' content – which is organized based on a very confusing algorithm – or you can visit someone's profile and view their own personal feed. 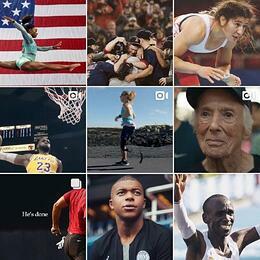 As a visual feed, an Instagram feed is filled with photos, videos and graphics. Photos are the most basic – and easiest – form of content a business can post on Instagram. Depending on what you want to capture, publish, and share on Instagram, photos are most companies' first choice. A photo should be clear, compelling, and encourage users to like or comment on it. An Instagram video can be up to one minute long and are indicated by a small white video graphic in the top right corner of the post. Instagram videos don’t have to just be a shot video. Companies like Adobe often use video to add a small, moving, visual element to an otherwise still photo. Overall, videos make great content for businesses who want to add something different to their feed. You can show users behind-the-scenes of product production or company culture, or even showcase a new commercial. Businesses should also consider posting boomerangs on their feed (they're awesome!) Basically, a boomerang is a quick video that is played forward then backward in a never-ending loop. An effective boomerang will entice someone to want to watch it over and over. It has action, color and purpose. Instagram Stories launched in August 2016. As a spin-off of Snapchat, Stories allow Instagram users to publish photos and videos with a shelf-life of 24 hours. Over 250 million users view Stories each day, and according to Instagram, one third of the most viewed Stories are created by businesses. To create an Instagram Story, click on your company profile photo in the top left of your Stories “feed” – this is the row of Stories that you can scroll through while you are on the feed tab. You can also click on your profile photo if you’re in your profile tab. Active Stories are identified by a pink ombre ring outlining a profile photo. Businesses can create Stories to share flash sales, demonstrate products in action, take users behind-the-scenes of your workplace, make quick announcements, or even tell stories in a series of photos and videos. Ultimately, Stories are meant to feel natural and unscripted – it gives a human touch to your company. Here at Bluleadz, we love ping-pong. When our co-workers play, we like to post fun video Stories to show them in action and capture some awesome volleys. A great bonus to Stories is that you can attach links to them*. If you just wrote an awesome blog post you want people to check out, have one of your co-workers record a few words about it and tell users to "swipe up" to read it. *Note: this feature is restricted to businesses that have more than 10,000 followers. Wait… what about Story Highlights? Recently launched in December 2017, Story Highlights allow users to store their favorite Stories on their profile for their followers to watch. Story Highlights appear under your profile bio, whereas Stories are clicked on from your profile photo. Unlike the traditional Stories feature, Story Highlights don’t disappear after 24 hours. Rather, you can choose any of the archived Stories you’ve posted in the past and create a themed Story Highlight, with the ability to add a title and cover photo. Many Instagram users and businesses will create graphics for their Story Highlights that better represent and identify the purpose of the Highlight. Great Story Highlights can be created to store blog posts, events, products, and company culture all in their own clustered category. There is no limit to how many Story Highlights your business can create – make them specific, attention-grabbing, and informative. Each Story Highlight can hold up to 100 Stories at a time; you can always add more, but when you post over the limit, the first one will be deleted. Instagram Live is a real-time video broadcasting feature. 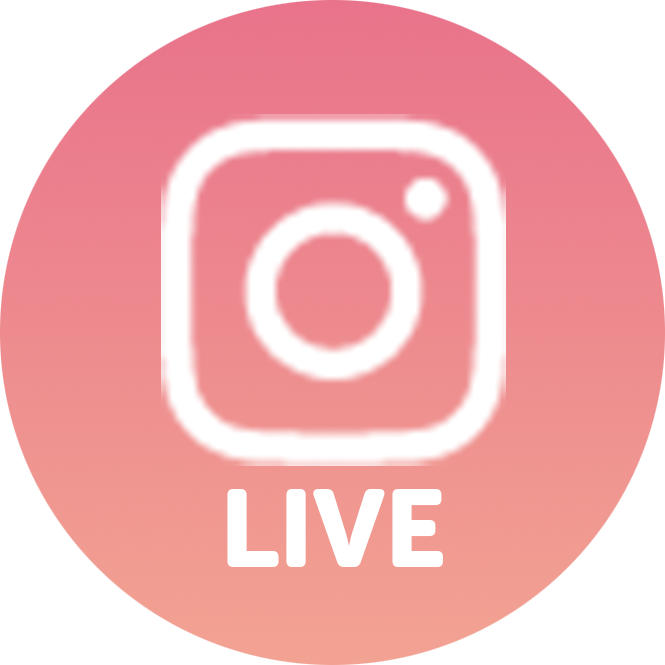 Companies can effectively use Instagram Live to broadcast events they attend or host or to live interview co-workers about specific topics. As long as you are staying relevant to your brand and industry, the sky's the limit. Instagram Live is a great tool to build brand awareness and engage with new audiences. These five video types will help get you started and earn you more business. With Instagram Live, you can see real-time comments coming through your screen. Videos like Q&As are a great piece of content for a Live video because you can have real-time engagement with other users. IGTV is still pretty new – it only recently launched in June 2018 – so it's hard to give concrete facts about the benefits and uses of IGTV for businesses. However, here's what we do know. The length of an IGTV video is 10 minutes (one hour if you have a large following). Videos are shot vertically and can be uploaded straight from your phone. You can still upload horizontal videos – it's just not as natural. You can include links in the video description. As with any content, you want to make IGTV videos valuable – give your viewers a reason to stay. Keep it relevant to your brand, share some tips, tell a great story, show them something awesome. It will be interesting to see how IGTV grows over the next year, but be on the forefront of this movement and experiment with IGTV today. Your company should consider wetting your feet in at least three of these four content types on Instagram. By experimenting with how you share information, you are increasing your engagement opportunities with potential prospects and leads. What Should the Tone and Voice of Your Instagram Content Be? The first thing to establish when creating content on Instagram is the tone. As with any social site, the tone of your posts should mimic your company's personality and the industry you work in. However, Instagram has proven to be a great place for businesses to get more creative in what and how they curate content for their brand. Many companies see Instagram as a creative outlet for their brand – a social site to highlight their company culture and show off a more human side to their name. Instagram allows companies to share visual content publicly in hopes of building new relationships and attracting new leads. Keep your tone and voice consistent; consistency proves to your followers that you stay true to your brand. Decide early on if you want your tone to be inspirational, helpful, adventurous, informative, etc. What Elements Should You Keep in Mind When Posting on Instagram? On social media, it is important to maintain consistency so your brand's image is present, clear and cohesive — the key word here being cohesiveness. Your business's Instagram should aim to attract new followers, giving you the opportunity to possibly convert these new leads into customers. Visual interest plays just one part in this process. While compelling content on its own can attract attention, how your feed looks as a whole is just as important. Before we start talking about aesthetic and layout, check out this video of HubSpot’s Instagram feed. 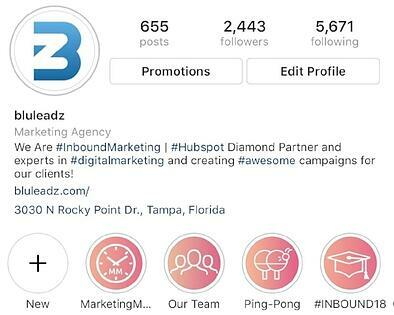 All of HubSpot's Instagram posts look very clean, but together the layout of posts creates a cohesive, eye-catching look. Many of their posts are videos and boomerangs, but their cover images for them are still very clean and colorful. Aesthetic and layout can be important to companies who want to focus on the look of their feed as a whole. While you see many travel, fashion apparel, and home furniture and decor companies killing the Instagram game with their aesthetics, it's definitely something that other companies shouldn't shy away from. Having a clear aesthetic when posting not only gives your feed a cleaner look, but it also makes it easier for you to post. 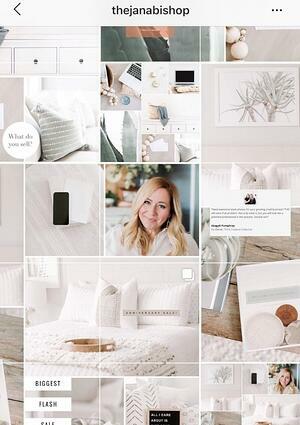 Here are some things to consider when planning an aesthetic for your company's Instagram. Are your posts consistent in quality and clarity? Do you want your posts to maintain a certain color scheme? Are you using your filters moderately and consistently? When thinking of a new piece of content to post, ask yourself if it will match the aesthetic you've created. If not, try to think of something else that might better suit it. Bottom Line: Your aesthetic should be consistent in every post you make. As far as layouts go, Instagrammers have continuously experimented with more creative ways to layout their posts and create their own design aesthetic within their Instagram feed. Even some of the biggest B2B businesses are beginning to play around with layout techniques. I won't go into too much detail about types of layouts — because there are a lot – and your company can basically do whatever it desires. A unique layout can help a business stand out in its industry. It adds a different vibe and more visual interest to your feed; it can also tell a reader that you put more effort in. Do some research on different layout structures if your business is intrigued. Interested in adding white borders to every photo to add the illusion of gutters to your feed? Go for it. Want to create “series” within your feed? Post three photos in a row that correlate. Ford has been doing this for a while, and it’s truly spectacular when you look at their feed as a whole: it’s like mini stories that draw you in and inspire you to check out more. This example, from @thejanabishop, shows a layout in which multiple pictures are posted side by side and actually create a full, combined image. 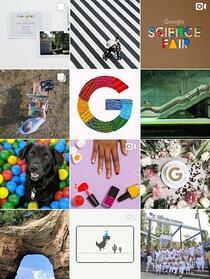 column Instagram layout) will shift. Luckily, technology can help you out. There are some really great apps out there that actually allow you to plan the layout of your Instagram feed based on the photos you are scheduling to post. Check out Mosaico, Unum, or Plann if this is something your business might be interested in. Even if a photo has great quality and color, it can always use some minor tweaking. That's what filters are here for. Instagram features 40 filters that users are free to use during the editing phase – but do not think that you should use all the filters. While there are definitely some great preset filters on Instagram... there are also some terrible ones. A WebDam report revealed that 60% of the top brands on Instagram put the same filter on every post. Sticking to one filter can help reinforce your brand identity: people will relate to the consistent color scheme and atmosphere it can create. An added bonus about editing photos on Instagram is that you can also adjust how heavy you want the filter to look (from 0-100). For example, If you like how Clarendon looks with your photo but don't want it to look so bright and highlighted, you can easily take the filter to, let's say, 75%. Bottom Line: Find what filters complement your brand voice and content best – then stick with it. For companies that may be nit-picky about their editing or want more options and editing capabilities, look into using other photo-editing apps. Apps like VSCO and Adobe Lightroom are great editing softwares for those who want to have a more free reign with their editing. Both apps also feature preset options; just save a certain style of edit and create a one-click apply edit that you can use on all photos. This is a simple way to maintain an aesthetic. I personally associate the quality of a photo to the quality and professionalism of a brand. If something doesn't entice me to look at it with great lighting, color, and effects, I probably won't look into the company anymore. The best edited photos are the ones that don’t look edited it at all. It is best to keep your Instagram photos natural, but a few filters here and there can help amplify your photo colors, contrast, sharpness, and overall quality. What About Captions and Hashtags? Captions are a huge part of effective Instagram marketing. The worst thing a business can do is not write captions for each Instagram they post. Captions tell a story. While the saying goes, "A picture is worth a thousand words," captions provide context to a photo. The character limit of an Instagram caption is a whopping 2,200 characters, but don't use every last drop. Rather, write a concise caption that either captures someone’s attention or inspires them to take a certain action. If you think a photo needs a little bit more backstory and would benefit from a lengthier caption, go for it. Ultimately, your brand knows what's best for your audience. Just keep in mind: Instagram captions are interjected by an ellipsis ( ... ) after two lines of text. A healthy tip for writing effective captions is to put your most important words at the beginning of your caption. Doing this will let your followers know the key point of your post. Is this caption appropriate for my audience? Is it a reasonable length? What hashtags should I include? Should I add a call-to-action? Bottom Line: Your captions reflect your brand voice – keep them consistent. Don't worry about call-to-actions just yet; later we will discuss how adding CTAs to your captions can help foster engagement with your followers. Okay, so what about Instagram hashtags? Using hashtags on Instagram gives can make your content more discoverable. When someone searches for a particular hashtag within Instagram, every post containing that hashtag (either in the caption or in the comments) will appear in the search results. Anything can be a hashtag; to create a hashtag, add a # before any unbroken word or phrase. 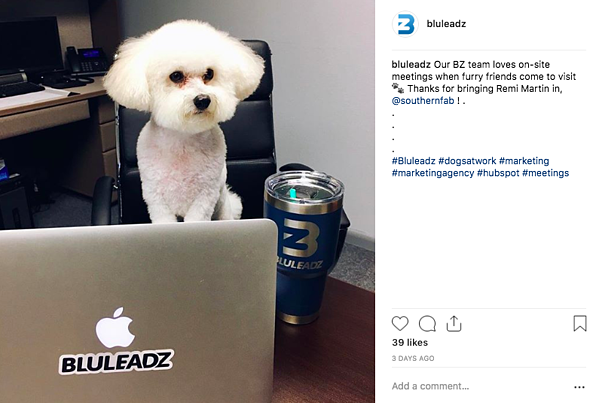 For example, #BZandMe is a hashtag we here at Bluleadz like to use on our culture-related posts. Hashtags shouldn’t be a mindless thing. An effective hashtag will probably brand your business and can help users find your content when they are exploring Instagram, allowing you to show your content to the people who are most likely to find it useful. Creating a hashtag makes a keyword or phrase easily discoverable. Anything can be a hashtag, as long as you add a # before it (no spacing between words; i.e. #BluleadzRocks). When you search a hashtag, you will see all the content with that hashtag attached to it. Create relevant hashtags for your brand. Don't go hashtag crazy (this can be a little more lenient on Instagram – see below). Just like on Twitter, using hashtags on Instagram is a great way to increase the chances of your content getting found. Bottom Line: Use hashtags – just not too many. If your company wants to add hashtags directly into the caption, then be cautious of how many you are using. 1. Separate Your Caption From Your Hashtags. 2. Write Your Hashtags as a Comment After Posting. Placing hashtags in the comments section will still associate your post with the hashtag, but ultimately viewers won't be as distracted by it. With both of these hashtag hiding hacks, you can include as many hashtags as you want – within reason, obviously. While the max number of hashtags you can include in a post is 30, you should try to stick to just the hashtags that are relevant to your company's brand. Ten to 15 is usually a good number to start with. If you need some place to discover some of the top-performing hashtags that correlate to your industry, check out Hashtagify. And this is only the free version: you can also buy a monthly plan to gain access to even more in-depth analysis about your business’s hashtags versus your competitors, hashtag suggestions for Twitter and Instagram, rankings of the most popular hashtags, and much more. There is a worldwide debate about the best times to post on each social media platform. Ok, it’s not really a worldwide debate, but there is a lot of speculation as to the optimal times to post on Instagram. The best times to post on Instagram ultimately depends on when your target audience is using the platform. Instagram’s Insights tool features an awesome section that charts out when your followers are most active on Instagram, both by day and by week. In general, the best times to post on Instagram is before and after work hours. People are more likely to scroll through their Instagram feed during their relaxation time rather than sitting at their desk. Again, take this information with a grain of salt. Each company will have a unique audience with peak engagement and login times. Experiment with different times of the day and different days of the week to see how your engagement rates may vary. Posting schedules should also consider time zones. If you have a geographically-specific audience, cater your posting schedule to their respected time zone. If you have a more world-wide audience, test out different times, and maybe find the timezone with the largest audience and focus your publishing schedule around them specifically. When it comes to how often you should post, the answer isn’t as concrete as you’d probably hoped. According to a Forrester report, the top brands on Instagram post 4.9 times a week. It seems that no one is really on the same page about how many times a week businesses should post on social media, though. Brian Hughes believes once a day, every day is optimal. Two posts vs. 107 posts is a pretty big difference. 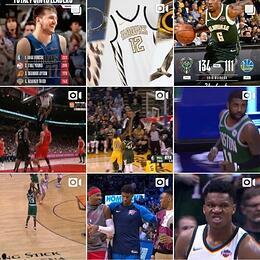 Obviously, the NBA is a world-known brand with a vast audience and can get away with posting over 100 posts a week. Don’t go that crazy – but depending on how engaging your audience it with the content you put out, you might want to experiment with posting more frequently. Use your best judgement when posting your content. Don’t spam your follower’s feed with picture after picture; but, if engagement is high and everyone seems to enjoy your content, you should try posting a few times a day to keep the engagement rising. Social media provides businesses with unique platforms to engage with their customers and attract new customers. What’s important to know here is that posting alone will not greatly affect your business. Sure, you may see an increase in your follower count, but have any of those converted to actual customers? Instagram, like all other social media channels, in a two-way communication platform for engagement, discovery, and discussion. Engaging with your customers is an important step in developing a strong and effective Instagram strategy, and it comes in more ways than you’d think. Inviting users to comment on your post may seem weird at first, but trust me, it does work! Following a caption with a question is one of the easiest ways to create engagement on Instagram. Depending on what your post is about, you can ask users for their opinion, recommendations, their favorite fill-in-the-blank. Posing a question that issues a personalized response or story about a user can help you learn more about who is engaging with your content. Think about the 5 W's and H when deciding on the best question to ask. For example, a tech company that advertises for its new software to tackle computer glitches could pose the question, "What was the worst computer glitch that ever happened to you?" A travel agency can ask, "What is the next big vacation you have planned? Tell us about it in the comments below!" TIP: Include the word "comment" or even the phrase "comment below" relatively near your question to further encourage users to comment – they could have misread your question or mistaken it for a statement. Over the years, Instagram contests have grown in popularity with B2C businesses. The great thing about Instagram contests is that anyone can enter, even if they don't follow you (as long as your profile is public). Decide what you want content you want to post to support your contest. Will you make a video telling people about it? Will you take an awesome photograph or make a cool graphic? Tell users how long the contest will run for. If your company reaches customers across various timezones, specify the timezone in which the offer will end (i.e. This contest runs from 8/15-8/30 at 11:59 p.m. ET). Restrictions are necessary if you are running a contest or giveaway for a specific city or it involves a prize that requires the winner to be of a certain age (typically 18+ or 21+). Make sure the prize you choose is enticing enough to urge people to enter. Typically, the more complicated the entry guidelines, the bigger the prize. It is important to explain when and how the winner will be selected. For giveaways, the winner should be chosen at random. Guidelines for giveaways typically only include following your business account, liking, or commenting on the giveaway post. Photo challenges are great contests to run because they generate quality user-generated content your company can utilize in the future. Tag your company in their photo. Include the photo challenge hashtag in their caption. By tagging your company in their post, you will be notified of their entry. Entries will "live" in the "photos of you" tab on your profile. Running photo challenges fuels user-generated content for your brand. We discuss UGC in the regramming section, but you should know now that it's always great to have a file of UGC on hand. The worst thing you can do when running an IG contest is just sit back and watch all these new entries come in and not interact with them to some capacity. If your contest requires someone commenting and telling a story, reply back with your thoughts on the story. Even if it's a "tag three friends in a comment," respond to some of the users with a simple, "Great! You're entered. Good luck 👍." It shows you are aware of their engagement. If your business is running a photo challenge, frequently search your hashtag and look through your entries. Go through and write personalized comments on entry photos – tell the user how much you like it, how awesome the quality is... whatever you want to say. Add a little side note and let them know they successfully entered the contest. Be sure to keep an eye out for new entries and jot down, save, or screenshot your favorites so your company will have an easier time picking a winner once the contest ends – imagine having to look through 10,000 entries at once. Yikes. Once the contest ends, it’s time to announce the winner. The best way to do this is to update the caption on the original contest post. Tag the winner in the caption so they receive a notification. It is also a best practice to either DM the winner or request they DM you so you can start a private conversation to get any contact and shipping information you may need. 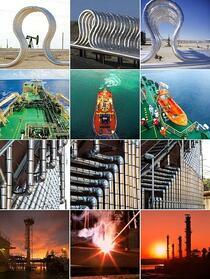 If you ran a photo challenge contest, post the winning picture on your company's Instagram. 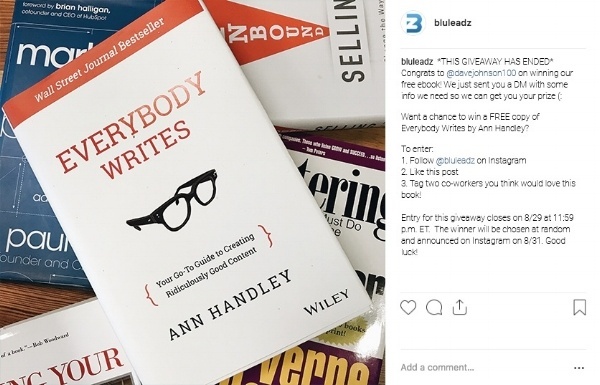 By doing this, you give visual credit to the winner and add an extra piece of user-generated content to your feed. However you decide to run your giveaway/contest, be sure it follows Instagram's promotion guidelines. The last thing your company wants is a lawsuit. Engagement isn't a one-way street. Responding to comments, whether positive or negative, is just another way to build relationships with your followers, start a new discussion, and learn what your audience wants from your company. The comments section is an ever-flowing stream of thoughts, suggestions, opinions, and emojis. Whether you post to your feed, to your Story, or an IGTV video, read your comments. Does anything stand out to you? Did some make a suggestion, comment, or critique that could better your company's social media presence? Once you strike up a conversation with someone in a comment thread, who knows where it can lead. You may get new content ideas, new product ideas, or even a new trusted follower that might spread the word about your friendly interaction. Always take what your followers say into consideration; if you see a popular comment about posting a certain piece of content, think about it. Engagement is all about listening, understanding, and interacting with those around you. User-generated content is one of the BEST kinds of content you can post on social media. Not only does it highlight your products or services in use, but seeing it from a user perspective rather than from the company itself creates a feeling of trustworthiness for other users. On Instagram, posting user-generated content is called regramming. That whole saying, "It's better to ask for forgiveness than for permission" doesn't really work unless you don't mind losing a valued customer. Comment on their original post or send them a quick DM asking if it's ok to post their photo or video on your feed, story, or even utilize on another social platform. Always give the credit back to the original creator. Tag the creator in the image, write it in the comments, and maybe mention the post as a regram. Even a simple "photo by: @SoAndSo" at the end of a caption would do the trick. If you want to repost content using another app, Repost for Instagram is a great app that adds a small note in the bottom left corner signifying the post as a regram and including the original owner’s handle. 3. Don't Edit Their Content. You don't know how someone will respond to their photo being heavily altered, so a best practice is to stay clear of any additional edits or filtering. If the content doesn't match your company's style or voice, try to find another piece of UGC to use. Search your branded hashtags (and other relevant hashtags). Look at photos your company is tagged in. Run an IG photo contest and use entry photos. For certain industries, businesses can and should add influencer marketing to their social media marketing strategies. Influencers are people companies hire or ask to promote their products and services. They post photos using your product or service, at your company location, or can post videos talking about how much they love your company and all you have to offer. I like to compare Instagram influencers to celebrities in commercials – when a great comment/review comes from someone you look up to or follow, the chances of you wanting it might increase. Influencers are basically Instagram celebrities (besides the real celebrities on Insta, of course). People trust what they have to say, and they do a great job spreading the word about your brand. Almost every industry could use some sort of influencer; find someone on Instagram that has high engagement on their account – don't get distracted by number of followers. A user that has high engagement shows that their followers are actually attentive to what they post and interact with it. Someone with one million followers could have terrible engagement rates (they may have even bought their followers). Running an effective marketing strategy requires monitoring your progress over time. It can be hard to tell if your new and improved tactics are really reaching the right audience and getting you one step closer to accomplishing your marketing goal. That’s why Instagram Insights can help you. The Instagram Insights tool is a built-in feature on the Instagram app. Based off what you post, who your audience is, and how engaged your audience is with your content, the Insights tool is a great place to check out often to track your progress of your objectives. The activity tab shows you the number of profile visits, clicks to emails, directions and calls for that particular week. It also can tell you your reach and impressions on your account. The content tab is a pretty nifty tab because you have the option to filter your company's Instagram statistics based on a variety of things. For your company's posts, you can sort them by impressions, likes, engagement, reach, etc. You also have the option to filter your post statistics anywhere from seven days to two years. When looking at story insights, you can filter by number of impressions, reach, replies, exit-rate, and even link opens (there's even more filters – check them out). These insights can be gathered from a time frame of 24 hours, seven days, or 14 days. As far as promotions insights, you can either create a promotion or view active promotions on your Instagram. From an active promotion, you can see the number of people who viewed the promotion, numbers of impressions and engagements, audience demographics and the amount spent on the promotion. The audience tab lets your company know everything about its active Instagram audience (those who follow and engage with you). The top locations insight gives you a geographical view of the top countries and cities your followers live in. Age range tells you the age breakdown of your followers and can be subcategorized by all followers or gender. The gender pie chart basically breaks down what percentage of your active followers is male and what percentage is female. In the followers insights section, your business can see the average times your followers are on Instagram (these are broken up by day) as well as the days of the week when your followers are more active. Take a peek at your Instagram Insights on a regular basis; every two weeks is a great time frame to start with. Are you reaching the age group you are trying to attract with specific content? Did you increase your female follower count after that giveaway you tailored toward them? Track pattern changes and shifts, and see how experimenting with new content affects your activity, content and audience insights. From there, your company can discover what is working and what isn't. Overall, measuring the success of your marketing strategy can boost your brand awareness and can help with building more relationships on all social platforms. With any social media channel, paying to boost and share your content will help you reach even more than just your followers. It can help spread the word about your business to people who have similar interests in your company. Because Facebook owns Instagram, paid Instagram content runs in the same fashion as Facebook content. Businesses can promote any published Instagram posts to reach a larger audience, similar to the “boost” function on Facebook. The promotion tool button is located both at the top of your profile and within each Instagram post. If you click the promotion button within your profile, select the photo you want to promote and then follow the next steps. You can also select which photo you want to promote by clicking on it from your feed and pressing “promote” underneath the post. This is where your company will decide where your promoted post will send people who click on it. You can select your Instagram profile, your website, or your storefront. 2. Select Your Target Audience. Choose whether you want an automatic, local, or manual audience. If you choose automatic audience, Instagram will target people with similar demographics to your followers. A local audience targets users who are still similar to your current followers but live in or around a certain location. If you decide to create a manual audience, you can personalize your target audience based on specific demographics, locations, or interests. The more interests you add to your list, the larger your potential audience gets. 3. Select Your Budget and Duration. The last step in promoting a post is to set the budget and timeframe for the promotion. As you adjust the scale for your budget and duration, you can see how your estimated reach changes. Use this tidbit to help you establish a healthy budget for your promotion. You don’t want to go overboard and spend thousands of dollars, but it may help to up your budget, let’s say, $50 if it estimates a higher reach by 200 people. Taking a quick peek at this before finalizing your promotion can ensure you aren’t going over the total amount you budgeted for. Instagram ads are created and managed through Facebook’s Ad Manager, so make sure your business’s Instagram account is properly linked to your business’s Facebook Page. Why Run Ads on Instagram? Advertising on Instagram, like any other social platform, is a great way to get your business in front of other people who might be interested. With Instagram ads, your business can target a defined audience for your promoted content. The overarching goal of running any ad is to gain more interest in your brand. While the technical concept of your ad is specifically tailored to the objective you are trying to accomplish, we will focus on some of the main aspects of Instagram ads to better educate you on the types and benefits of running them. What Types of Instagram Ads Can You Run? Photo ads are simple and clean on a feed. You can use square or landscape images. Just like photo ads, video ads can be either square or landscape. You can share video ads up to 60 seconds. Carousel ads allow viewers to swipe for additional photos or videos within the same ad. This can be useful for businesses advertising for multiple products or businesses trying to show multiple uses of one product. Stories ads will appear while people are watching their friends’ stories on their feed. Depending on what your advertising objectives are, you’ll want to carefully consider the ad type you choose to run. However, by experimenting with all of these types of ads, you can track which formats perform best and use that data to drive the rest of your digital advertising efforts. Speaking of objectives, Instagram breaks up their ad objectives into the three subsections of the buyer’s journey: Awareness, Consideration, and Decision. Take a look at all the objectives Instagram wants your business to consider. Keep these objectives at top of mind when building out your Instagram ads. You'll want to consider the type of ad, the CTA button you want, and the additional content to provide based on your advertising goal. Influencer marketing is a great way to utilize other Instagram users to help you sell your products and services. Adding Instagram influencer marketing into your overall Instagram marketing strategy can increase your brand awareness, grow your follower counts, and result in more sales for your business. When influencers share about your business, it becomes more relatable to your audience. It can be seen as a recommendation from a friend because people trust influencers. They are basically Insta celebrities. Find Influencers Relatable to your Industry. This one should be obvious, but it can easily be overlooked. The influencer you work with should be able to relate somehow to your industry, whether they work in it or are a prime representation of a person who would buy your products. Find Influencers With a Relatable Following. Branching off of the first tip, you should always double check that the people your influencer would be promoting your brand to can actually benefit from it. If you are spending money on an influencer, you want positive results, right? Their audience should directly reflect the audience you are intending to target and promote to. You should also be sure to take note of how much engagement their posts typically get. Follower count isn't always the number one thing to look for; you want an influencer that gets their audience engaged in a conversation. The end goal of any marketing strategy is to attract new leads, gain new customers, grow your reach and better your business. With Instagram, your business can do just that. Remember the importance of targeting the right audience, actively engaging with them and giving them content they enjoy, and tracking your progress over time. Take what you learned from one marketing strategy and apply it to the next. Your marketing strategy should be ever changing and ever growing with the ebb and flow of marketing trends and the growth of social media as an effective marketing platform. What may work now may not work in the future, but that’s the beauty of marketing – we adjust to those changes to and strategize new ways to reach the right audience, better our products and services, and strengthen our brand.